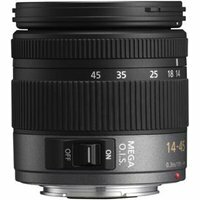 The Panasonic Micro 4/3rds 14-45mm Lens is a standard range zoom lens for the Micro Four Thirds system. Offering an equivalent focal length of 28-90mm, the lens is suitable for a wide range of subjects, including landscape, travel and portrait. The lens incorporates aspherical elements to reduce distortion and an optical image stabiliser to make hand held shots shake free, even at relatively slow shutter speeds. The 30cm close focus distance give a magnification of 0.34x meaning that macro style photography is another string to this lens' bow, and the whole package is housed in a compact and lightweight body that won't feel out of place on the front of any Micro Four Thirds compatible camera.